“It’s only a sin if you get caught.” Catchy tag line. 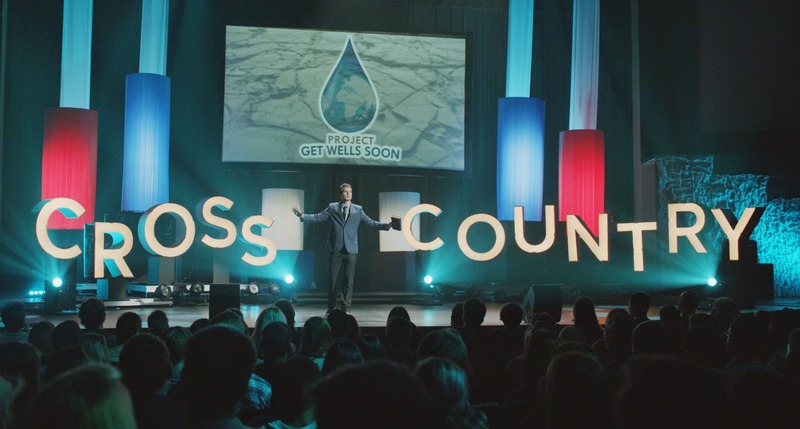 Mix spoiled, semi-obnoxious frat rats in financial trouble with Christian charity-based fundraisers touring the country for cash and Jesus and you have a comedy/drama that people can’t really quite find anything redeeming in. There is truly no one to root for, care about or even like. This offering from Dallas based Lascaux films production company (co-founded by former WFAA film critic Gary Cogill) and directed by Will Bakke stars an ensemble cast coming from a variety of backgrounds. Filmed in Austin, TX over 20 days with an approximate budget of 2.5 million, this first feature from locals Riot Studios (known for docs such as Beware of Christians and One Nation Under God) seeks to challenge viewers’ previously held notions and cause them to examine and re-evaluate them. All it really does is tell us what we already knew to be true, about emotional manipulations and the misappropriation of funds that happens each and every day in the world of Christian fundraising, and it doesn’t really make us any happier watching it on the screen. The film explores and exposes what most people have come to know as the “seedier” side of Christian fundraising . Aussie actor Alex Russell (The Host, Chronicle, Carrie) plays Sam and sort of likable Greek with a big problem. His scholarship has run out and he needs 9 thousand plus dollars before the next semester if he is going to be able to attend law school ON SCHEDULE, mind you, when he could take a year off and work for the tuition. Oh no, can’t have that delay. Instantly it is hard to feel very sorry for the poor boy. His cronies, get roped in for the ride after not thinking too long or hard, when he proposes that they create fake charity (digging wells in Africa to save children and provide them with water- it has a corny name) and become inspirational speakers and fundraisers for said charity. Max Adler (Glee) plays pal Baker, Dallasite and Harvard educated Miles Fisher (Madmen, Final Destination 5, J Edgar) plays preppy Pierce, and Sinqua Walls plays tech/sound guy Tyler (and is the ONLY one who has any reservations at all about embezzlement and (let’s just call it what it is)- Stealing. The Frat pack is formed. After their first successful even on campus, they are tapped by promoter Ken (character actor Christopher McDonald) to join a 27 city tour of the gullible South to increase their take exponentially and join in with his musicians, led by the inspirational, but musically vapid Gabriel (Zachary Knight- Parenthood). We must have the perky, perpetually smiling, blonde, former mission worker and uber Christian girl to provide the romantic triangulation opportunity. Callie (Johanna Braddy- Easy A) fills in here. She is necessary for our poor misguided Sam’s “come to Jesus” moment that we know is going to happen, but remember, only if he gets caught. There is a big of funny stuff, most apparent when they are putting their game plan together for “revival training” , learning the emotionally manipulative “ tricks of the trade” gestures and phraseology of inspirational fund raising, in order to maximize the profits and ultimately their take. Of course, someone is going to get real and get a conscience. And reputations must be protected at all costs, even if they are fake to begin with. 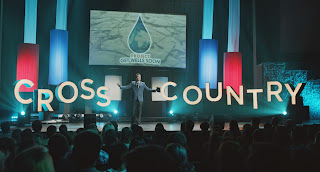 The performances come across as superficial and often overdone, which may have been intentional but not unlike the folks within each church on every corner, the television orator fundraisers or the professional ones who have to keep paying their rent on their multimillion dollar houses, their expensive cars and 4 grand designer custom suits. The comedy tried way to hard and is only occasionally funny. The overall cheesiness may have also been intentional but that does not endear the story to us, or its hapless characters. Ultimately I found absolutely no one that I even remotely liked. There was no one to root for, cheer for or even care much about, even when they started to develop consciences. It was an annoying reminder of the state of religious fundraising and political fundraising that has existed for most of this century as small groups toured the countryside, setting up tents to evangelize, save your soul and take your hard earned money. The film made me think about things I didn’t really want to think about. That people are greedy and corrupt, that organized religion is often greedy and corrupt and that gullible people are everywhere. Facades and emotional manipulation are a means to an end. And when there were no real consequences, I just felt cheated again and mad. I am not sure what this script was trying to do but we really don’t have to go to the movies to be reminded of these realities. It is in the paper and on the news each and every day. Evil and greed always has been and always will be.